The Forestry Commission will pay beneficiaries of the youth in afforestation programme their July allowance next week. The Chief Executive Officer, (CEO) of the Forestry Commission, Kwadwo Owusu Afriyie gave the assurance on Wednesday. 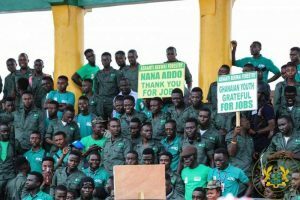 Some workers of the Youth in Afforestation program of the Youth Employment Agency (YEA), who are planting trees in selected areas across Ghana had threatened to embark on a full strike if the government and the Forestry Commission failed to pay their accumulated allowances by the end of this month. The workers, who have not received payment for over three months, also cited a breach of their contract following a review of amounts to be paid them going forward. The group planting trees within the Achimota forest and Klagon in Accra, this week staged a demonstration to protest the delays. But Mr. Owusu Afriyie has now told workers that their allowances will be paid via the E-Zwich platform. Meanwhile, the workers who were not happy with the latest announcement are still demanding full payment of their arrears. The protesting workers who expressed worry over the commission’s failure to pay them for three months warned the commission to pay them or incur their wrath. “We have given them up to the end of this month to settle all indebtedness. We understand this is a donor-funded project so if funds have been released why should people work without allowances,” one of the beneficiaries, warned in a Citi News interview. Government employed some 20,000 young men and women across the country to help manage the country’s forests, combat desertification and tackle land degradation. President Akufo-Addo stated that the programme is in line with the NPP’s 2016 manifesto commitment of reforestation, forest rehabilitation, and forest protection activities. “That is why today, we are deploying an army of twenty thousand young men and women who are going to help restore our degraded forests. The Programme, which has an initial two-year life span, will be extended based on satisfactory results,” he said. The post We’ll pay youth in afforestation next week – Forestry Commission appeared first on Citi Newsroom.